RAILROAD.NET • View topic - Open-jaw commuter rail fares? Does the commuter rail tariff provide for open-jaw fares? For example, if you're taking a one-way trip from Gloucester to Newburyport, or Brockton to Needham, is there a ticket that's any cheaper than two singles? Sorry if this should be an obvious "no" since the T's website says nothing about it. But I figured it couldn't hurt to ask, since all of the other big commuter railroads in the Northeast do this (LIRR, Metro North, NJT, SEPTA). Re: Open-jaw commuter rail fares? There is no provision or ticket available to these types of trips. The tariff does not even allow for anyone traveling on trains that require a transfer en route. It is just an unspoken rule that we accept the fares from the previous train. Most commuter lines do have a single rate fare for connecting from one branch to another (SEPTA has a $8.50 fare for travel via the Center City Tunnel or via connections in Center City, however the $4.00 intermediate fare does not including transfer from one branch to another at outlying points, eg. Glenside, Wayne, requiring two intermediate fares for each leg). 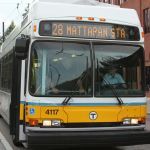 Does intermediate travel on two MBTA lines connecting at intermediate points (Salem, Braintree) still considered as "interzone travel" (example Newburyport to Rockport via Salem would be a 4-8 combination)? R36 Combine Coach wrote: Most commuter lines do have a single rate fare for connecting from one branch to another (SEPTA has a $8.50 fare for travel via the Center City Tunnel or via connections in Center City, however the $4.00 intermediate fare does not including transfer from one branch to another at outlying points, eg. Glenside, Wayne, requiring two intermediate fares for each leg). The question I have is with MBTA Intermediate fares - Example: Rider boards at Canton and wishes to travel to Providence via Route 128...What would that fare be? Does the MBTA allow same-direction transfers on Commuter Rail trains? Canton to Providence doesn't even make sense for a multitude of reasons - first of all, I presume you mean Canton Center as opposed to Canton Junction? Canton Center is on the Stoughton branch while Canton Junction is on the Providence line (NEC). Then it is worth noting that Canton Junction and Canton Center are 0.7 miles apart, so logically anyone in Canton going to Providence would just walk or drive over to Canton Junction and board a Providence train (which runs MUCH more frequently than the Stoughton branch anyway). Additionally, why go up to Route 128 in the first place? Just change at Canton Junction. As for what the fare would be, it would be an Interzone 6 fare ($4.75), regardless of whether you board at Canton Junction or Canton Center, since they're both within the same zone. And with the new mobile tickets, it wouldn't matter anyway, as they're just for a specific pair of zones for 90 minutes. I've gone from Ipswich to Waltham before by purchasing a zone 6 one way ticket, and changing to a Fitchburg outbound at North Station, using the same still active ticket. Honestly though are there really that many opportunities to transfer between MBTA CR lines without going through Boston? deathtopumpkins wrote: As for what the fare would be, it would be an Interzone 6 fare ($4.75), regardless of whether you board at Canton Junction or Canton Center, since they're both within the same zone. Are you sure? SERY's post implies that Canton Center to Providence would *not* be allowed on one ticket, and that you'd need an Interzone 6 plus a separate Interzone 1.
deathtopumpkins wrote: And with the new mobile tickets, it wouldn't matter anyway, as they're just for a specific pair of zones for 90 minutes. I've gone from Ipswich to Waltham before by purchasing a zone 6 one way ticket, and changing to a Fitchburg outbound at North Station, using the same still active ticket. So mobile tickets don't specify inbound or outbound? Wouldn't that allow people to get a free return trip, assuming of course that the schedule allows it within 90 minutes? You shouldn't need an interzone ticket if traveling within the same zone. At least that's been my experience. I've never seen confirmation of this anywhere for outer zones, but I have for travel within zone 1A. And regarding the mobile tickets, yes you theoretically could do a round trip on one ticket if it was within 90 minutes. Just like bus round trips are only one fare if within 90 minutes. The mobile tickets do say origin and destination stations, and inbound or outbound, but they're in small print you have to scroll down to see. What you show the conductor is just the zone number. I've never come across one who actually cared which stations on which line the ticket was purchased for. The paper tickets always just had the zone number as well. deathtopumpkins wrote: You shouldn't need an interzone ticket if traveling within the same zone. At least that's been my experience. I've never seen confirmation of this anywhere for outer zones, but I have for travel within zone 1A. You'd pay an Interzone 1 fare traveling in the same zone. Interzone fares don't apply to any 1A station. With regards to the mTickets - during the rollout training to traincrews, it was explained that the ticket was valid for approximately 1.5xs the duration of the trip. As the zones are based on mileage, a Zone 2 ticket would "time out" well before a Zone 8. So if you boarded a train in Worcester, activated the ticket, traveled on an express train, got off at Back Bay, raced upstairs, just catch the Orange line, make record time to North Station, sprint to a Fitchburg train, and show the same mTicket, it's *possible* you could get that second ride for free. The circumstances however are extremely rare. Now it's possible the parameters of the app have changed to this 90 minute timeframe, but there was no notice to that effect. Regarding interzone tickets: if you travel in the same zone, say Canton center to canton junction or Wellesley square to Wellesley farms, you're traveling within one zone, so you would pay the $2.75 as mentioned previous. Let's say you want to travel from Canton Center to Providence. Technically you would buy a one zone interzone fare to get to Canton Junction, then you would have to buy a 6 interzone ticket to travel from junction to providence. daytripper1 wrote: With regards to the mTickets - during the rollout training to traincrews, it was explained that the ticket was valid for approximately 1.5xs the duration of the trip. As the zones are based on mileage, a Zone 2 ticket would "time out" well before a Zone 8. Is there an official policy if an mTicket has to be unexpired just until a crew member checks it, or for the entire trip? For example, if you board a train to Worcester, and 2 minutes later the conductor checks your ticket, but the ticket is only valid for another 10 minutes after that, is it valid even though it will expire before you get to Worcester? Officially they're only good for one trip. So if the conductor asked for it again father down the line and it expired, you'd be on the hook for the fare. Whether or not they'd actually try to collect the fare is another story. You could probably just tell them you were trying to catch an earlier train, activated the ticket, and then missed it, and get by just fine. Going off topic here and we are not getting into a conversation on how to use mTickets to beat the fare.